Even though school holidays are over, the Zoo is still teaming with international visitors, lots of whom must walk from the city since they keep turning up at the station without myki cards. Lots of people from mainland China at the moment – (Chinese New Year) – which is lovely to see, but trying to deal with the fact that our ticket machines don’t give change or deal with foreign credit cards and that even single trip users have to buy a myki smart card, can be very complicated when there is little or no shared language. Luckily I’ve been able to enlist the help of mandarin speakers on the platform. Once they know the score, people often go off and call a cab. With North Americans I don’t have communication problems, but my heart sinks when I discover they have no change. North American credit cards don’t have pin numbers and our machine takes nothing else. Last week one tall and very handsome American, gave up and went outside to call UBER. He was joined by two sleazy looking characters (you know the sort, skinny blokes with tatts and bad teeth) with a large Rhodesian Ridge back dog. The guys started admiring his Blue tooth headset in a way that made me a bit nervous so I went out and hovered around protectively. 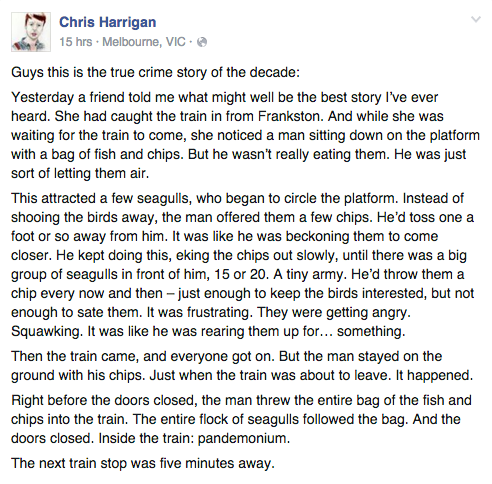 But instead of mugging the man, when they found out he didn’t have a ticket, they offered to give him one of their spare myki cards. (Most Melbournians have several by now) Then we all stood around and patted the very good-natured dog until the train came. One of my wheelchair travelers is a young man of middle-eastern origin and poor English. I don’t know if he didn’t understand that the driver would get a ramp out for him or if, as seems more likely, he is building up his strength to get in to the train without help. Some very fit individuals do. But he’s not there yet and last week he didn’t hoik the chair up high enough and it got caught on the lip of the train. Over went the chair, tipping him face first onto the train floor. He didn’t fuss, though the rest of us were flapping about in a tizz – train driver, station staff, fellow passengers. But the young man simply crawled around on his hands until he was in a good position for someone to lift him back into his chair. He’s got the determination to get there eventually. But I was relieved he waited for the ramp this week. All the station stories seem to be about animals this week – at least on the internet. 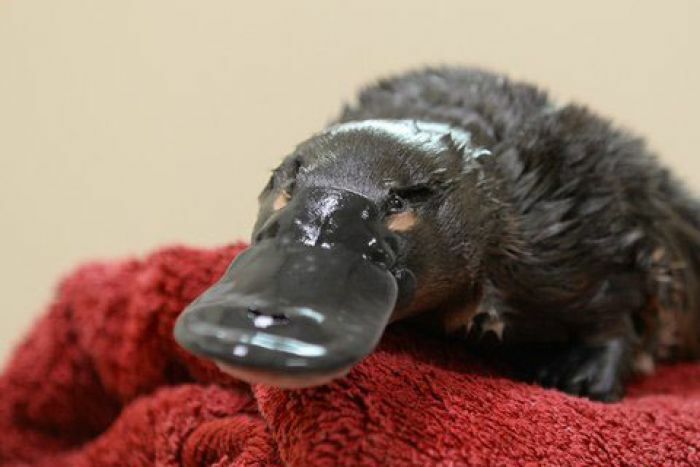 Platypus found at a station in Queensland. Feedback from other railway workers range from “urban myth” to “I hope its true!” to “anythings possible on the railways.” I’ve got no witnesses yet.